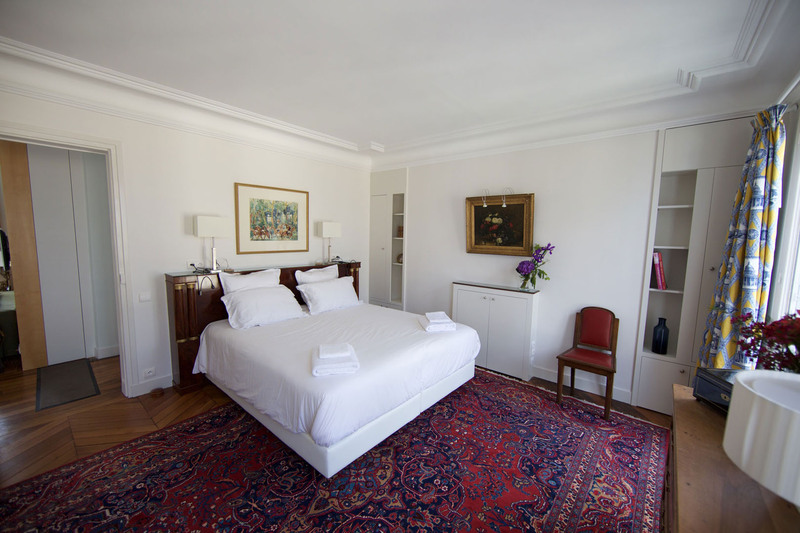 The apartment has 2 bedrooms with a king bed (180x200cm) while the second bedroom has a queen bed (160x200). Both beds can be made up as twins (singles). 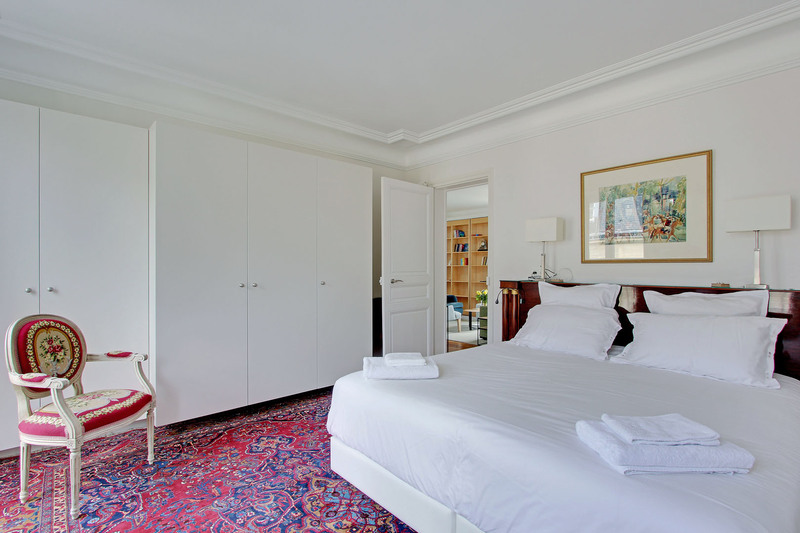 Each bedroom has ample closet space to store your new designer Parisian outfits! The bedrooms are on opposite sides of the apartment allowing each family a comfortable private space. There are two bathrooms and altogether 3 wc's. The living room has a large flat screen TV and comfortable sofas. The grand kitchen- dining room is a great space to get together at the end of the day and cook up a French meal or to plan your next day's visits. 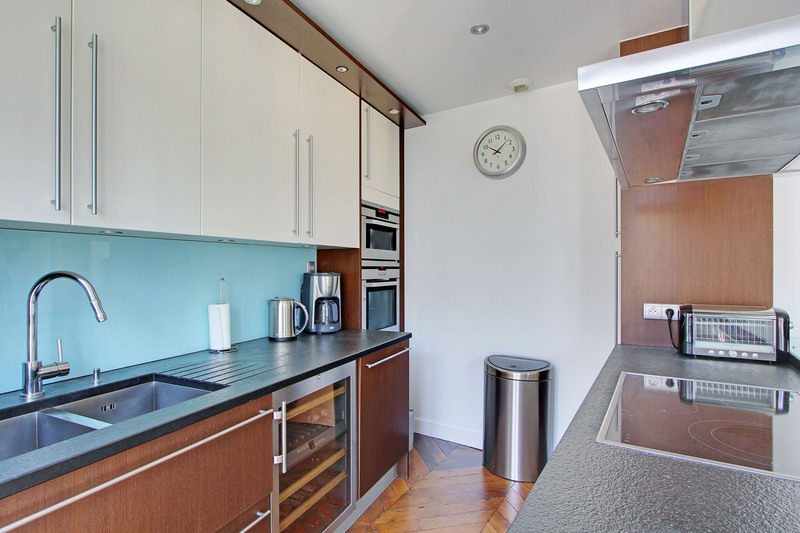 The apartment is a haven of modern and comfortable furnishings with all the appliances you could wish for. 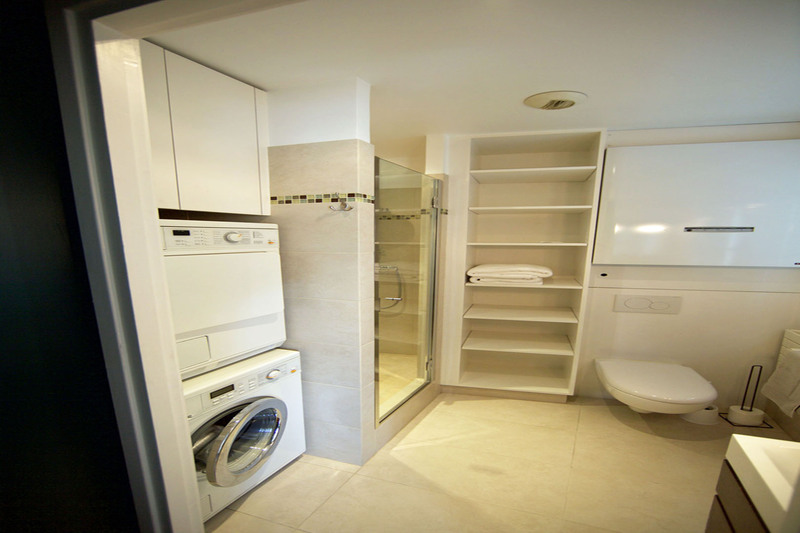 There is a washing machine and separate dryer. 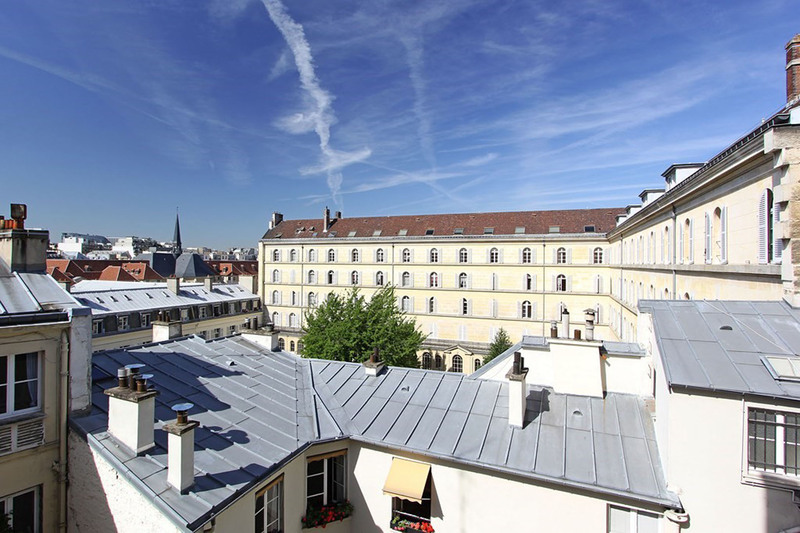 Near the Bon Marche department store with a gourmet food emporium and the boutique shopping of St Germain, the area is ideal for central Paris location on the left bank. Metro Sevres Babylone is a few steps away while metro St Sulpice is also close by. You are about 10mns walk to Boulevard Saint Germain, and a few minutes from the boutiques of St Germain and litterally on the doorstep of the Bon Marche department store with the finest gourmet food hall in Paris. There are 9 buses steps from the building taking you directly to all the sites. 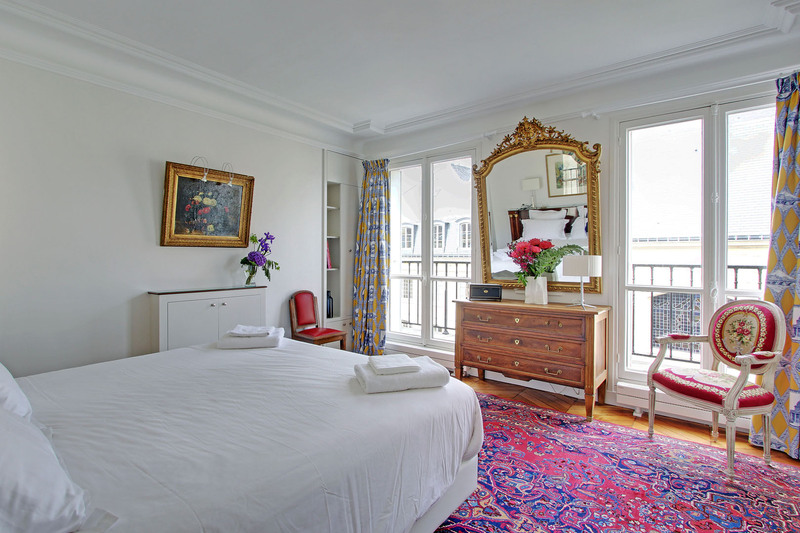 From the apartment you can walk to the Musee D'Orsay or the Louvre or hop on a bus for a few stops. Near the Chapel of Our Lady of the Miraculous Medal a chapel on rue du Bac, revered by Catholics as the site of three apparitions of the Virgin Mary in 1830. Nearby is a garden called Jardin Catherine-Labouré which was once the vegetable garden of a convent and is now open to the public. With 7,000 square metres of lawns and greenery and orchards, it's a perfect space for walking and relaxing - Located a few steps from your apartment on Rue de Babylone. Hidden behind a tall wall and high wooden doors it's open to the public from 9 am to 9.30pm in summer and closes earlier at other times. 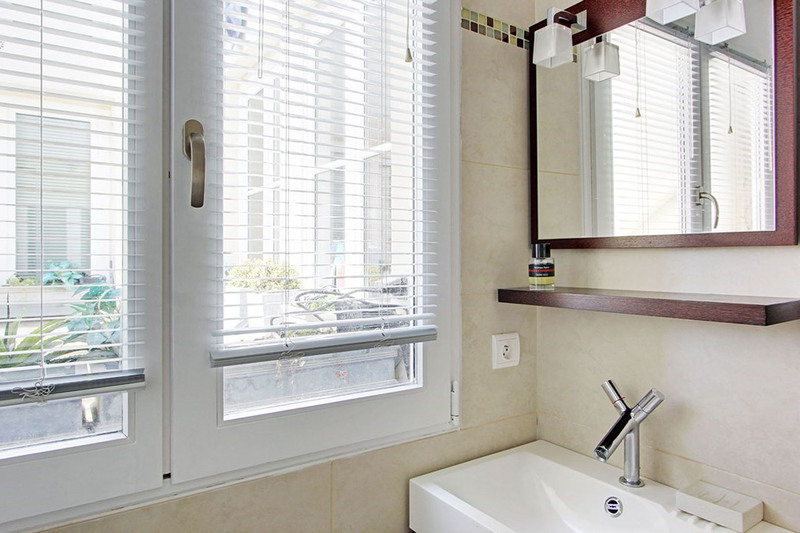 We prefer the 7th, and this apartment is in the best of that arrondissement. Close to shops, Metro and just about anything you want to do. Safe building, very quiet. Would rent it again. 4 women had a wonderful stay in this roomy apartment. The beds were changed to two single beds in each bedroom. Great location. 20 - 30 minute walk to all of the Paris highlights: Eiffel Tower, Louvre, Orsay Museum, Latin Quarter. Great restaurants 2 -3 blocks down the street. We even found a wonderful Italian restaurant with glutten- free pasta and pizza (Gemini Family). The apartment was excellent—location, size, attractiveness, ease of location and would definitely recommend to friends and family. 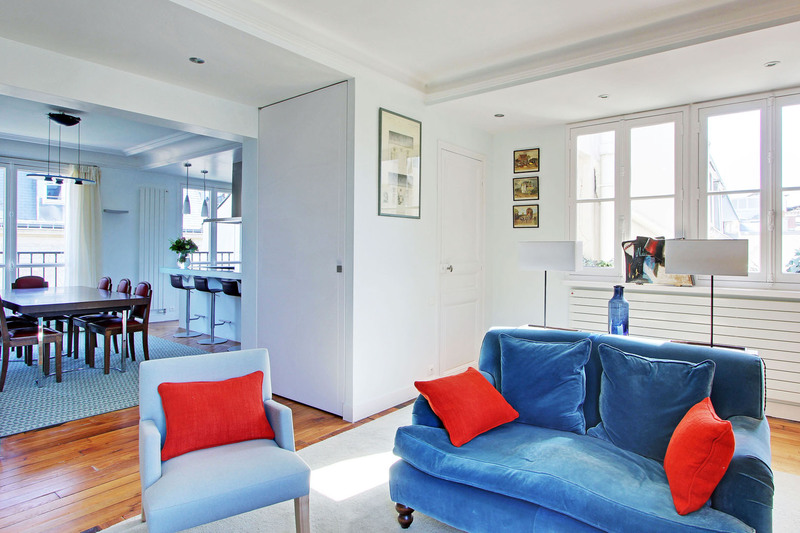 Rue de Babylone 17 is a fantastic apartment. Location Location Location. It is an apartment with lots of light. It is nicely furnished and equipped. Perfect, for a family of four. We rented this apartment for 10 days over Thanksgiving break. The Food: As other reviewers mentioned, the grocery store around the corner (Le Grande Epicure) was amazing. We used the kitchen several times during our stay. We loved Casa Di Mario- the pasta and pizza were some of the best we've had (try "pizza mama") we ate there numerous times as they were still open when we returned after long days of exploring. Le Nemrod was recommended by a local for late night eats and we loved the atmosphere- the food was good too. If you are looking for a great burger, check out Le Babylone just past Le Bon Marche. The Apartment: We were greeted by Georgina who helped with our luggage and offered suggestions on what to see in Paris. The apartment was very comfortable and it was clean. The toilet seat in the wash closet was broken when we arrived and the exterior curtain in the second bedroom was broke as well but they sent someone out immediately to fix them. We didn't plan on using either so it wasn't a big deal but we were impressed at how quickly they addressed the problem. If you are debating between staying in a hotel or renting an apartment, I highly recommend this apartment. We are typically hotel people and I was hesitant to ditch the convenience, concierge, and housekeeping of a nice hotel. However, after much research most people recommended staying in an apartment if you planned to be in Paris for more then 5 days. I am so glad we decided to go this route! 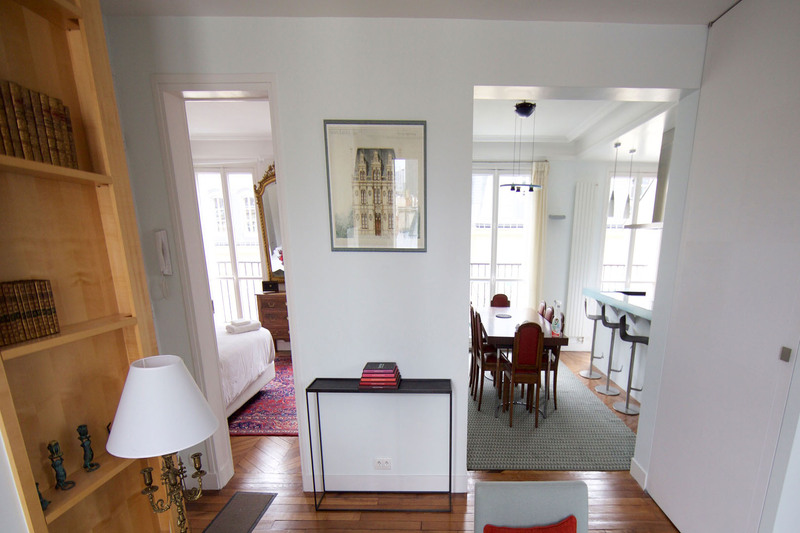 We are already planning our next trip to Paris and hope that this apartment is available for our next stay. This place was INCREDIBLE. It exceeded our expectations from the moment we arrived. It was so helpful to have someone from the rental agency meet us upon arrival to orient us to the apartment. It was the perfect space for 2 couples to spend a week in Paris. The location was amazing. Close to great shopping and restaurants, plus easy access to the train. Kitchen is well equipped if you want to cook a meal at home. Not only that, but it's steps away from a fabulous market where we stocked up on the basics. If you are hesitating at all, BOOK IT NOW. You won't regret it. This is a wonderfully spacious, light filled 2-bedroom apartment in the 7th, literally next door to Le Bon Marche, Le Grande Epicurie (LBM's luxury market), Marcel (waffles! )and Angelina's (yum!) to name but a few. You have metro choices within a city block and you are centrally located enough to walk to all the big Paris highlights (Eiffel, Lux Gardens, Musee Rodin, D'Orsay, Louvre, Notre Dame etc) It was our first time staying in the 7th as our daughter is living in the 15th as she is studying abroad, and we had a fabulous time. Very quiet at night (safe as well) and the noted church bells in previous reviews, are delightful. Highly recommend the apartment and Paris Rental Connections. Bon Voyage if you go and thanks to Elodie from PC for a great rental experience! The apartment was excellent—location, size, attractiveness, ease of location and the service. 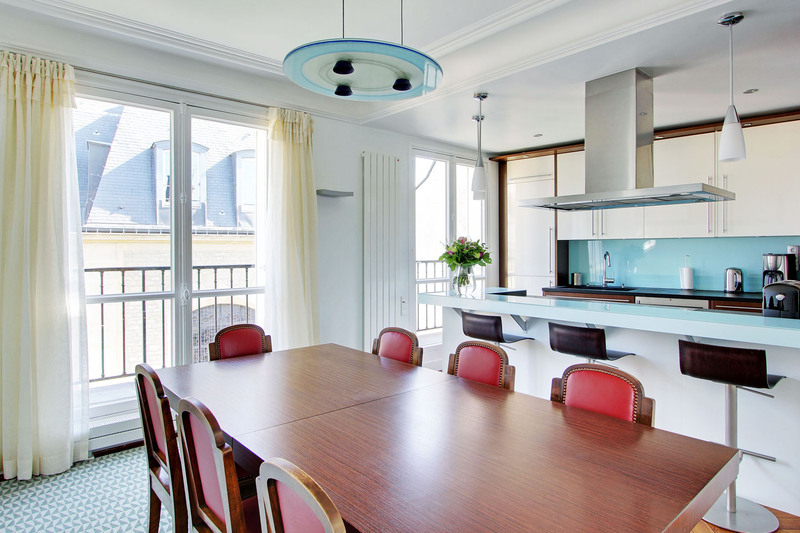 We spent such a nice time at Paris Babylone, an incredible apartment! 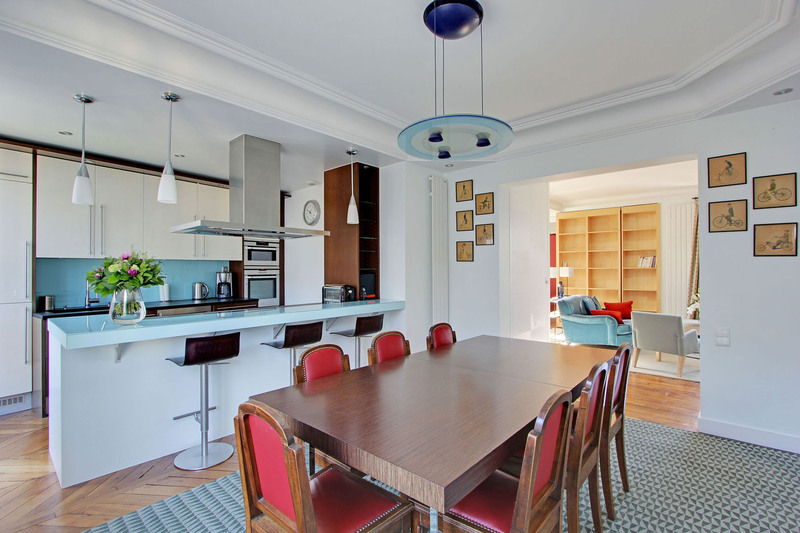 We recently spent some days with my mother and my sisters in this incredible apartment, Paris Babylone.Everything was perfect ,all neat and impeccable.The neighborhood was excellent, close to everything. Cherline,who was the one who received us,was very kind,a luxury hostess. I would be very happy to rent it again , I will recomend it to all my friends. We spent 5 nights with with 4 women for a girl's getaway. 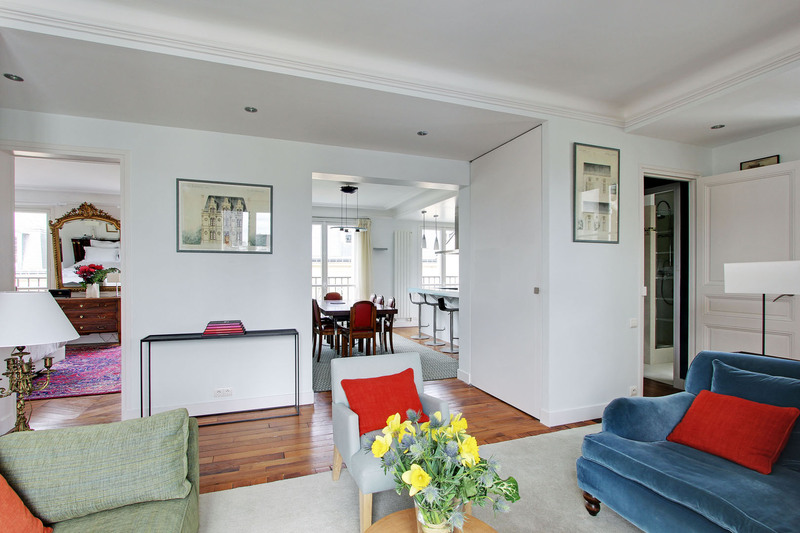 We loved the location of the apartment, close to the metro and walking distance to the Rodin Museum and other sites. We loved doing our grocery shopping at the Grand Epicurean Market around the corner. An extra special treat was when we realized that the Chapel of Our Lady of the Miraculous Medal was around the corner. The apartment was stocked with everything we needed. Check in and Check out were very simple. We look forward to returning to this gem of an apartment in the future. 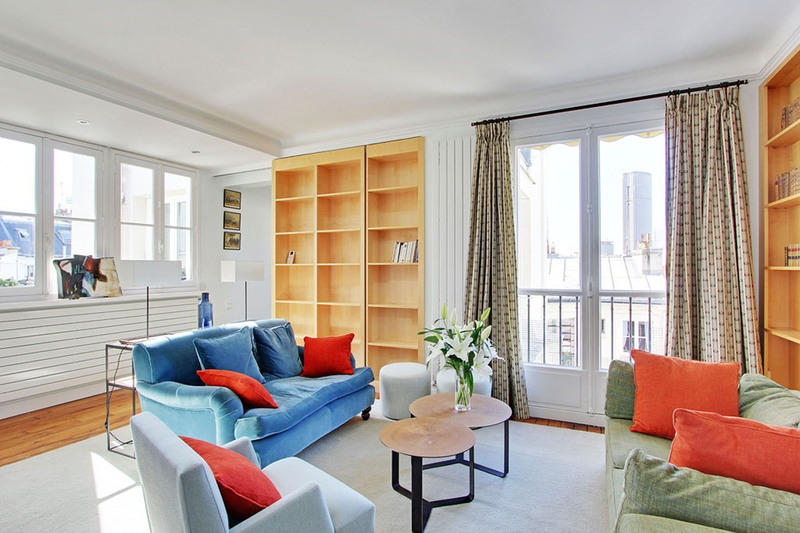 This is a fantastic apartment right in the heart of Paris. It was so easy to get to, very close to several metro stops, easy to walk to shops and restaurants and plenty to see and do. The apartment was exactly as pictured and describe and our check in was great. She took great time so show us how everything worked and explain the area. Highly recommend this one! Appartement à la localisation idéale quand on recherche à la fois le calme, la proximité de commerces prestigieux et suffisamment d'espace. Rien à redire, ni sur l'accueil, la propreté ou l'équipement fourni, que du positif. Hautement recommandable à un tarif habituel pour le standing et le secteur. Lovely apartment, best location, very good size, comfort and decoration, looking forward to staying here again!!! My mother, two family friends, and I stayed at this apartment during our 1 week stay in Paris. I've frequently visit Paris, so I was looking for a location that would be in close reach of everything (local restaurants, coffee shops, supermarkets, metro stops, etc). The apartment our arrival was very clean, organized, spacious (emphasis on the space), and bright. Each room could comfortably sleep 2 people. There was a ton of closet space and cabinets for our belongings. I think one of the best things about the apartment was the balconies (and the balcony table and chairs provided) which would be ideal for a nice outdoor meal. The area is quite, and the apartment is located right next to a church so waking up to church bells was very pleasant! All the kitchen appliances are new and modern and great for those who are a little sick of eating out all the time and want to cook something at home. I loved that the apartment was just a few steps from Le Bon Marché (the department store) and Le Grand Épicerie which is an organic supermarket which also has freshly prepared food/meals, breads, really anything you could think of. As an avid art enthusiast, it was pretty amazing that the Musée Rodin was only a few minutes away. 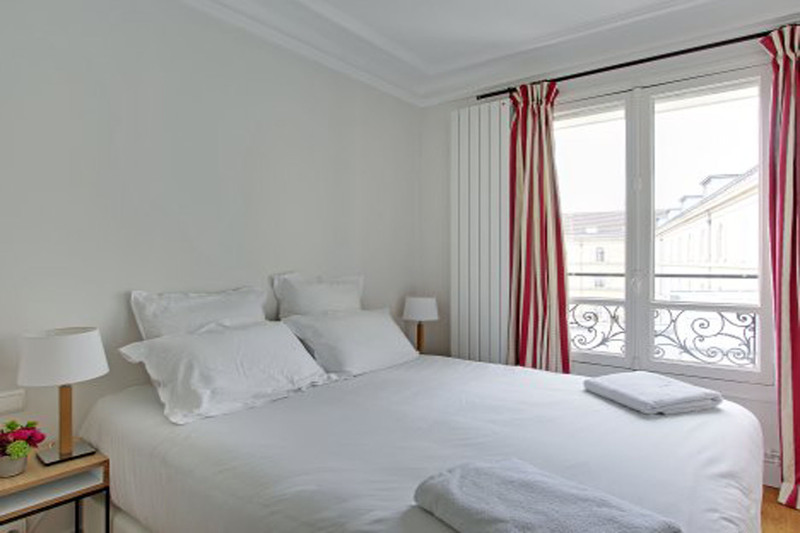 If you want to stay in Paris like a local and experience more of La Rive Gauche, then this is the ideal apartment for you! Simply put, this apartment had everything my wife, older mother and I could have hoped for during our 9 day stay in Paris. As others have noted, the location is within walking distance from a number of popular sights. With a couple of metro stations blocks away, the apartment is within reach of just about anything you'll want to do in Paris. 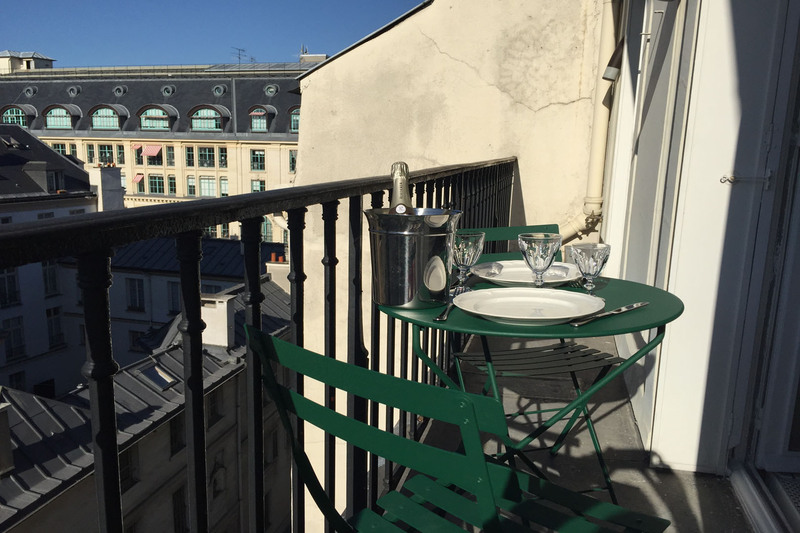 From our initial inquiries, to our arrival to the apartment, to the return of our security deposit, communication with Paris Rental Connections was seamless, thoughtful and easy. The apartment is spacious and bright with plenty of room for our party of three, two couples or a small family. There is ample storage for a longer-term stay and the rooms are thoughtfully laid out, with creative uses of the space. Find a secretary desk tucked behind a bedroom closet door, inviting a bit of time with your travel journal; a "secret" bookcase slides across a doorway to close off a living space. 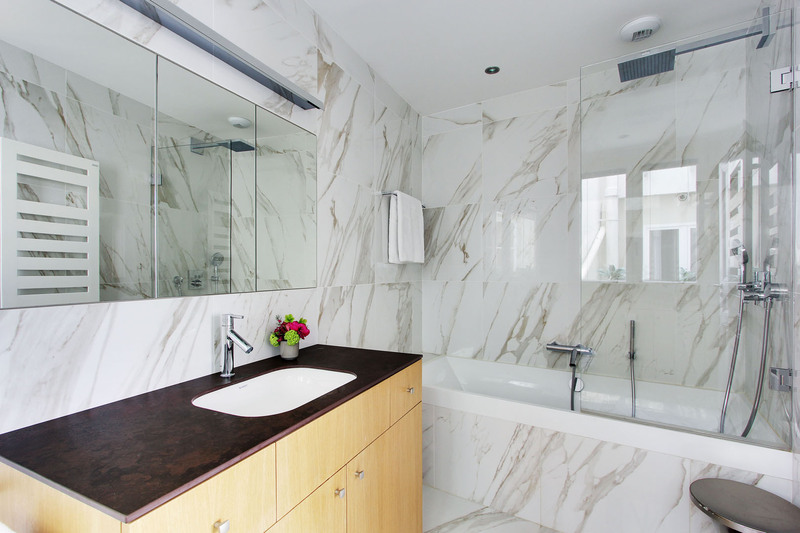 The bathrooms are all well-appointed with high quality finishes. One of our party particularly appreciated the deep soaking tub after a long day of sightseeing. And the fact there are 2 full bathrooms and a WC means no one is ever waiting. The beds are very comfortable and the apartment is quiet at night. 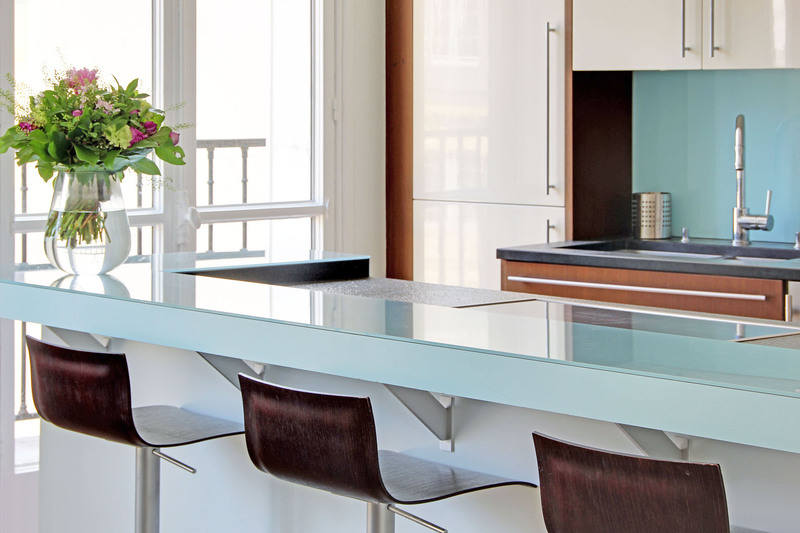 The kitchen is well-supplied to make a meal of anything you've brought back from the Raspail organic market or Le Grand Epicerie and the dining table offers enough real estate to host a party or spread out your maps for the next day's planning. Only two very minor issues: the microwave was out of service during our stay and requires repair. The bells in the belfry adjacent to the master bedroom may be a nuisance to late sleepers. They boisterously toll every quarter hour from 7am to 10pm. This said, we found it charming. I wholeheartedly recommend this apartment and we were frankly sad to close the door behind us. Instead of a dim, cramped hotel room, we looked forward to returning each day to the bright, cheery flat we called home. Tamera B. said... Nov 30, 2016 Perfect apartment! 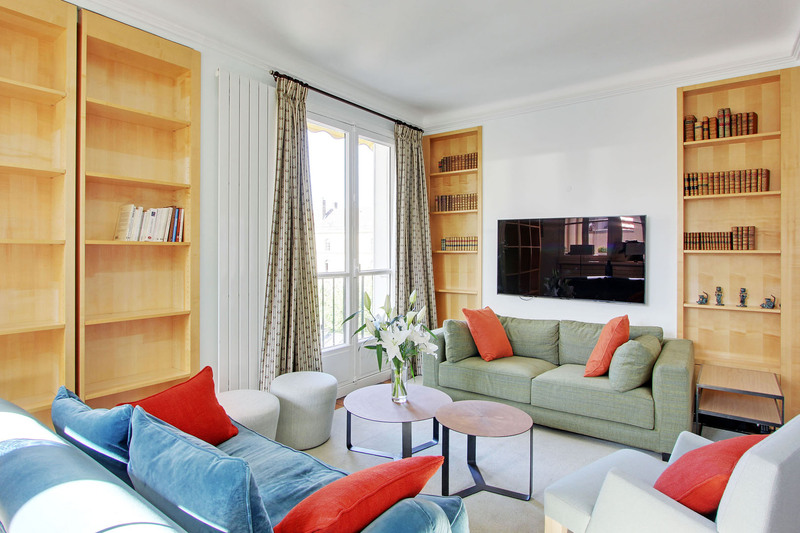 17 Rue de Babylone, Paris, Île-de-France, 75007, France Date of Stay Nov 22, 2016 Helpful votes: 0/0 This apartment had all the amenities you could want for a stay in Paris. Beds were comfortable and building quiet at night. Cherline the agent was there when we arrived to show us everything. Le Bon Marche is close by for shopping and a gourmet market. Walking distance to multiple cafes/restaurants. Metro stop with 2 lines 1 block away so easy to get around the city. It is on the 5th floor with only a 2 person (small persons) elevator but this was not a problem for us. So much better than staying in a small hotel room. Our adult daughters were vacationing with us and they loved it as well. Would definitely go back! This was our first visit to Paris and we rented the apartment for 5 nights in September and were extremely pleased with the apartment. Our party of three had ample space to move around. Upon our arrival we were met there by one of the representatives from the agency who went over the entire apartment including how to use the appliances. Kitchen was very nice and had all the necessary equipment. The location on the 5th level was perfect - quiet, very secure, clean, within walking distance to many sites, shopping and cafes and very close to a Metro station. There was a gourmet grocery store, Le Grande Epicerie de Paris, right around the corner where we were able to pick up provisions for the apartment. Only odd thing was the second full bath (largest) did not have an outlet. Overall I would highly recommend the apartment. We stayed at this apartment for one week and loved it. It was the perfect location with many sights within a 20 minute walk, Le Bon Marche right next door, with its amazing food market, and a lovely park 2 minutes down the street. It is on the next to top floor and has wide open views in three directions. 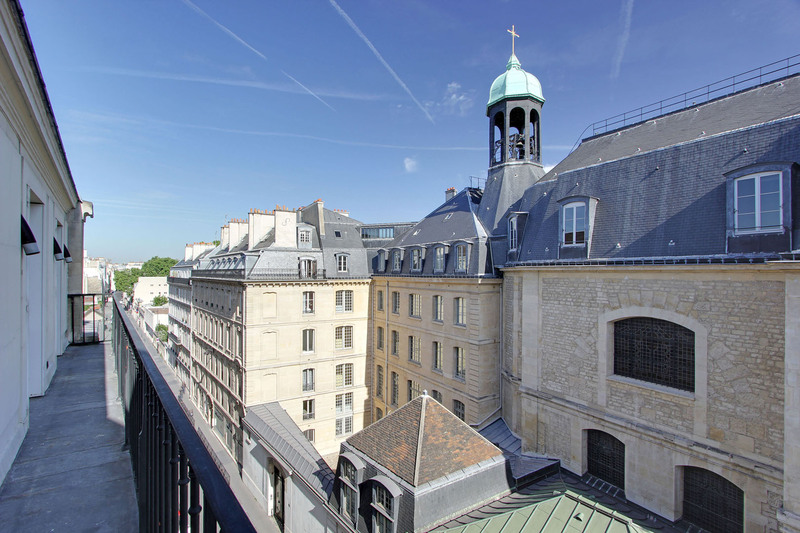 The main view is a lovely stone building with a church's bell tower directly across Rue Babylone. The only negative is the ringing of the bell beginning at 7am but the floor fans white noise solved that. 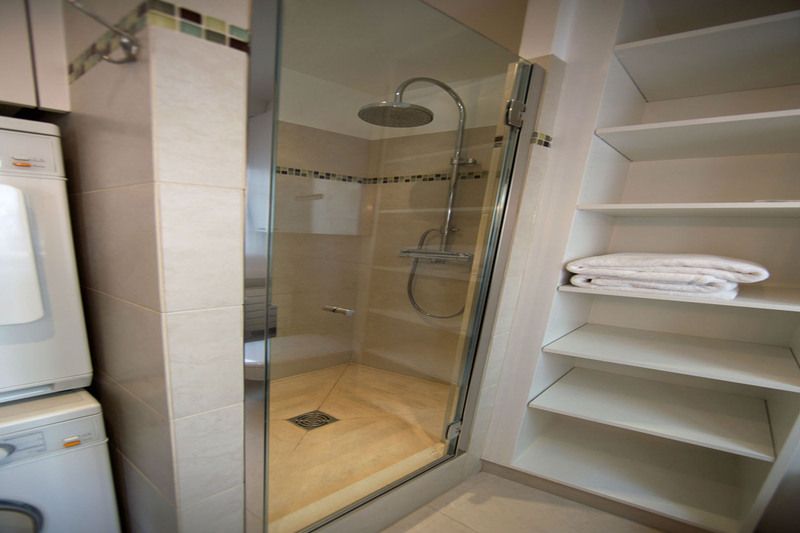 There are three bathrooms with three toliets and two shower/tubs. One of these had the washer/dryer which got a lot of use during our stay. It was clean, well appointed, and a great place overall for us and our two children. SPACIOUS, SECURE, CLEAN AND IN A GREAT ST GERMAIN LOCATION! We stayed at the apartment for 4 nights in July. We took a taxi from the airport and the agent met us at the apt. The description was very accurate, the apt was spacious, airy and clean. There was three of us and my teenage son had his own bed and bath. The apt is very well stocked with everything you need. We did not cook but we used the microwave to heat up meals that we purchased at La Grande Epicerie (upscale grocery store) located around the corner in Le Bon Marche. 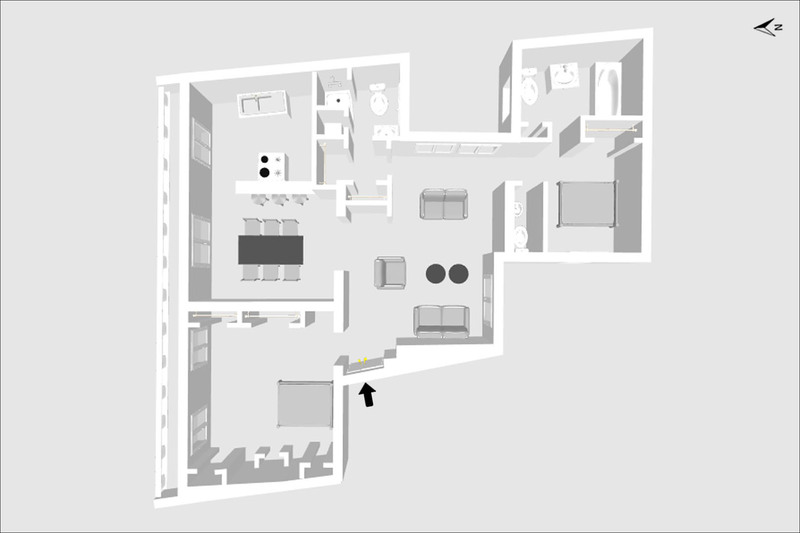 The layout of the apt is good, if you had two couples, you would easily have your privacy, the bedrooms are on opposite sides . We enjoyed our stay in Paris and I think you need a few weeks to take in all in. We toured the Eiffel tower which was breathtaking at night, the Louvre ( you can spend an entire day in this museum its huge)! We also walked to some local restaurants such as Costume café, Eggs & Co and Poilane Bakery where the apple turnovers are delicious!! If you take a left out the apt, a short walk behind a large door/gate is a park. There is also plenty of shopping and cafes in the area. We also used Uber a few times to get back to the apartment after tired from walking all day. We used Uber to get back to the airport, it was a lot cheaper than a taxi, very reliable with clean cars. The management company was very professional and very easy to work with. One more thing, The blue couch needs to be replaced, it is not firm. Overall, after a long day of walking around, this apartment was a great place to come back to, the beds were comfy and I would recommend to friend. Our family of three enjoyed our stay in Paris and can't wait to return!